Traveling into the alternate dimension known as the Negative Zone to rescue some children, Spider-Man found his suit's colors bled away, leaving this black-and-white suit behind. First appearing in 1998's Spider-Man #90, this costume doesn't have any special powers - it's just the atmosphere of the Negative Zone making it turn weird colors. Same thing happened to the Fantastic Four, remember? In the comic, the coloring was black and gray, but it was "this is supposed to be white but coloring limitations mean it can't be" gray, while the Minimate's gray is just gray. There was a ToyBiz repaint in the '90s that did the full-on black and white correctly. 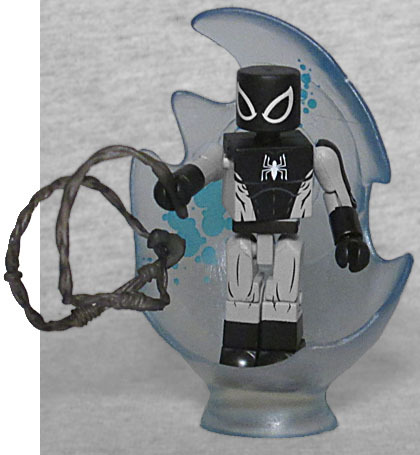 This Spidey comes with the same web Minimate Spideys have been coming with since Series 1, but this time it's molded in smoky translucent plastic. Cool! To simulate the portal he jumped through, we get a big base to stand him on. There have been several villains who have taken the name Jack O'Lantern over the years, but all have worn a similar mask and most have carried deadly pumpkin bombs. And all of them have based their costumes on second- or third-hand Green Goblin tech, which is why Notorious J.O.L. is wearing a chainmail jerkin with flared gloves and pirate boots. The colors are black and green, which is at least somewhat Irish-y (if his name was Jack McLantern, we'd be looking for something Scottish, instead). The chest is painted with a little bit of muscle and some scales to suggest its texture, but the balls of the shoulder joints are white, so they flash visibly whenever you move the arms. The pumpkin bomb is reused, but the hover platform isn't: Jack doesn't ride a goblin glider, but instead just hangs out on a floating disc, so we get that and a flight stand to lift it. 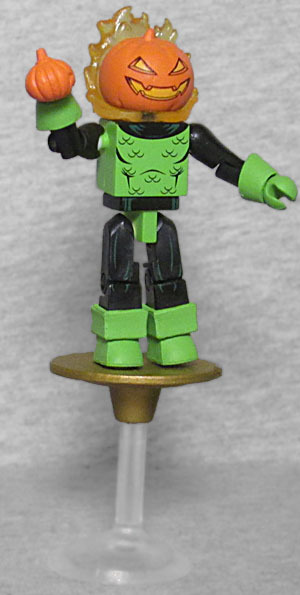 The pumpkin-head mask he wears is a new mold, not taken from the NBX Minimates, and that means the halo of flame that tucks in behind it is new, too.